The Crown chakra is situated on the top of the crown or head area. 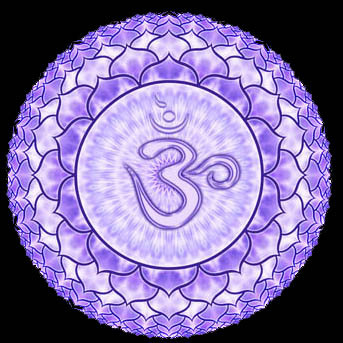 This chakra is represented by the colours white or violet Sahasara mandala and is symbolised by sacred spirits. The Crown chakra links us to our highest guidance, creation and is the foundation of our spiritual body. Spiritual will, idealism, inspiration and celestial knowledge are influenced by this chakra, as it is our connection to the universe. The Crown chakra physically influences the cerebrum, cerebral cortex, central nervous system, the pituitary gland, pineal gland and all the hormones related to them. A balanced Crown chakra releases us from ego driven desires, we know that we are guided and we trust in our highest guidance. Once the crown chakra is open you’ll feel a small amount of pressure, tugging or at the crown of your head. This chakra’s balance is affected by the balance of the previous six Chakras. When a Crown chakra is blocked we are still guided but this is more ego driven guidance. One will feel uncertainty, have little self-confidence and will experience anxiety and fear. This will in turn create negative influences in the physical in the form of misunderstandings, forgetfulness, apathy, immune disorders, and headaches, cognitive and mental problems. Balancing and unblocking the chakras helps to realign the Crown chakra – meditation on a continual basis is a great way to balance this chakra. Spend plenty of time connecting with your higher self, inner self, spirit guides and the source. Ask for guidance with regards to your needs and concerns and when you least expect, the answers will come to you. A daily meditation – remaining connected to your higher self or source. The crown chakra is not affected by healing foods. Instead get plenty of fresh air and sunshine. Nutmeg (Myristica Fragrans), Gotu Kola (Centella Asiatica). Alexandrite, amethyst, sugilite, purple fluorite, diamonds, quartz crystal and selenite.